Alt-right activists protested the removal of a Robert E. Lee statue from what is now called Emancipation park in Charlottesville, Virginia today. White activist Jason Kessler organized the Unite the Right rally, and Richard Spencer and Tim Gionet are attending. 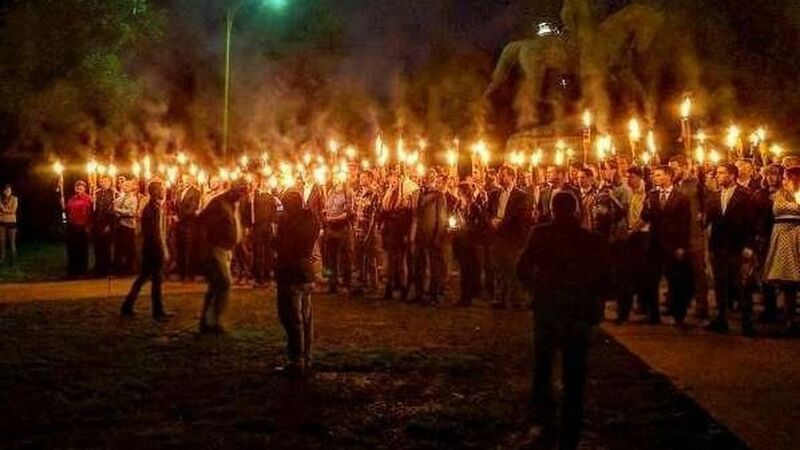 Last night, hundreds of alt-right supporters marched onto the lawn of the University of Virginia, bearing torches and chanting "white lives matter" and "you will not replace us." The main Unite the Right event took place this morning. Anti-fascist and Black Lives Matter activists among other anti-fascist and anti-racist groups held counter protests during the rally. Kessler has encouraged protestors to avoid violence, but to prepare to defend themselves. Airbnb has cancelled several reservations made by those planning to attend the rally, telling NBC29, "When throughout background check processes or from input of our community we identify and determine that there are those who would be pursuing behavior on the platform that would be antithetical to the Airbnb Community Commitment, we seek to take appropriate action including, as in this case, removing them from the platform." Members of anti-fascist and anti-racist groups were also on the scene last night and several fights broke out at the foot of the Thomas Jefferson statue. Police broke up the fights and sent protestors away. Witnesses on twitter and in live YouTube videos claimed that chemicals were dispersed. Last night's march was sparked by a federal judge ruling that the Unite the Right rally could go on in Emancipation park as planned, according to Fox News. City officials had announced earlier this week that the protest must be moved to a different park further from the downtown area as they expect thousands of protestors to show up. The American Civil Liberties Union (ACLU) of Virginia and Rutherford Institute, filed an injunction early Friday, demanding that the rally continue as planned and won. Virginia Gov. Terry McAuliffe has ordered members of the National Guard to be on standby at the event today, and declared a state of emergency after things turned violent. He said in a statement, "Men and women from state and local agencies will be in Charlottesville [on Saturday] to keep the public safe, and their job will be made easier if Virginians, no matter how well-meaning, elect to stay away from the areas where this rally will take place." Sounds familiar: The KKK held a similar, torch-bearing protest in the beginning of July, which was met with 1,000 counter protestors and resulted in 23 arrests.